Flash back to 1977. Star Wars has rocked the world and become an absolute phenomenon. Nobody had ever seen anything like it, and the blockbuster was born. In its wake came the scramble to create merchandise. Before the film came out nobody was interested in creating anything for it, and really back then it wasn’t a thing. We had lunch boxes and occasional toys, but it really wasn’t like these days, where you can slap Han Solo on a bag of oranges. 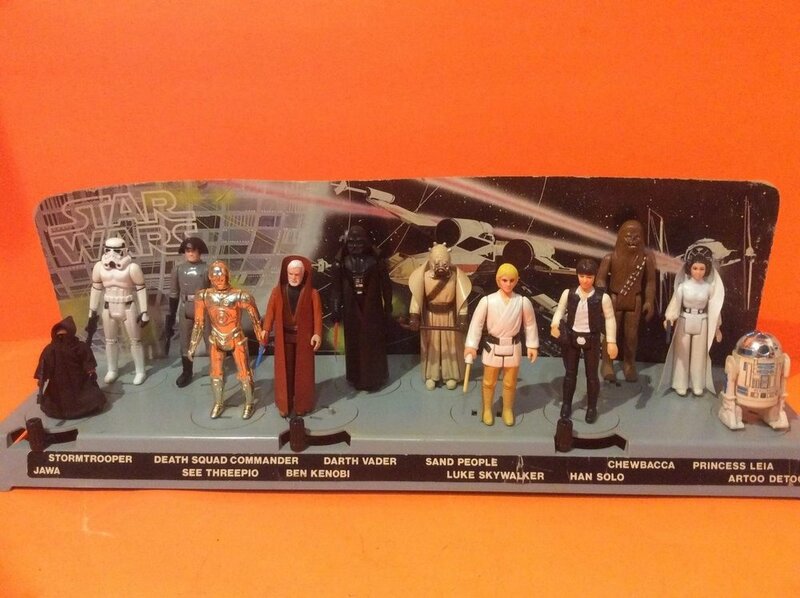 A small fledgling toy company named Kenner won the rights to the toys, but had absolutely no way to create an entire action figure line before the important holiday toy buying season. So they hatched a brilliant plan, to pre-sell the figures with a certificate that came with a display for the figures. Yes, they sold an empty package for Christmas, and we all had one. Flash forward to last Friday when I received quite possible the coolest present I’ve ever been given, this glorious reproduction by my dear old friend Peter Abrahamson. Me and Pete go way back, we actually met on what was the first film gig for both of us, The Blob in 1988, and we’ve been friends ever since. Remember the Battlebot Ronin? That’s his! He’s one of the most brilliant guys I know and I’m proud to call him friend. After giving my family a tour of where he works, a mechanical think tank and technical wizardry wonderland called Applied Invention, we made a quick trip to his house where he unveiled this. I’m still in shock at the level of nerdy awesomeness. While most of us way back when were satisfied with the cheap cardboard display that was in our early bird, included in the package of the figures we waited eagerly for there was a coupon to send away for an upgraded stand. And once you see this you can truly appreciate the level of detail and deep dive that Pete put into his creation. Look closely and you’ll see that even the backdrop has been meticulously recreated in LEGO. Add to that the three swiveling levers, the brilliantly build figures and the custom sticker (including the term “Death Squad Commander”, something that always baffled us) you can see it’s a labor of love and dedication from a fellow nerd that shares my passion for Star Wars. Thank you from the bottom of my heart Pete, I’ll cherish it. You can find more of Pete’s work at his website Ronin Brick Studio, check it out!